July and August are months when the south-east trade winds normally reach their maximum in Seychelles, leading to large ocean swells that send waves crashing on to exposed beaches. These have the potential to cause erosion of sandy beaches, especially during spring tides that accompany new and full moons. In addition to shifts of vast quantities of sand (see blog post of 27 July 2017), these conditions can destroy coastal vegetation, realign beaches and sometimes destroy eggs and chicks of nesting seabirds. 2018 has been another “unusual” south-east season. Although Sooty Terns began nesting early, which is usually associated with an early start to the south-east trades, the winds have remained light and the sea correspondingly calm, with only light swells. 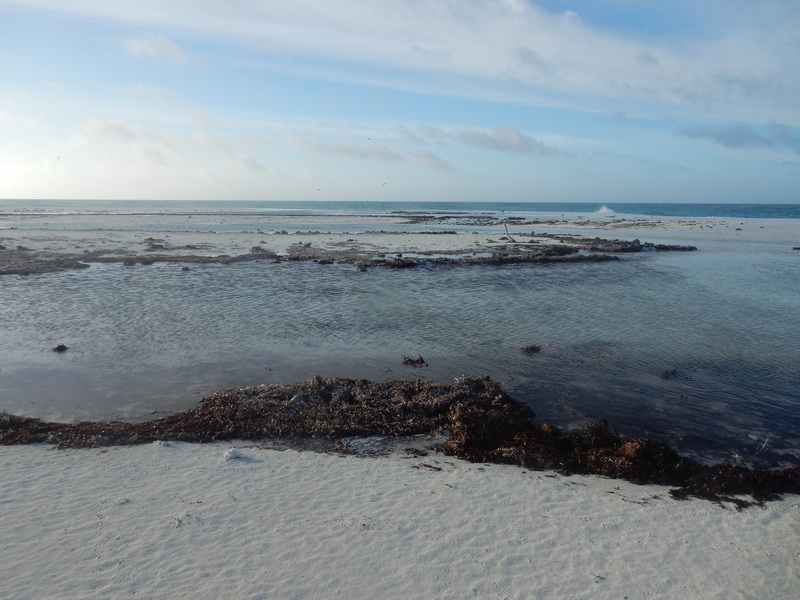 Despite this, new and full moons have produce larger swells in the otherwise calm seas but, unlike 2017, the swells have not breached the western beach on Bird Island or created further havoc in the Sooty Tern colony. On 13 July, however, the north-eastern beach (“Hirondelle Bay”) was pounded with huge swells. 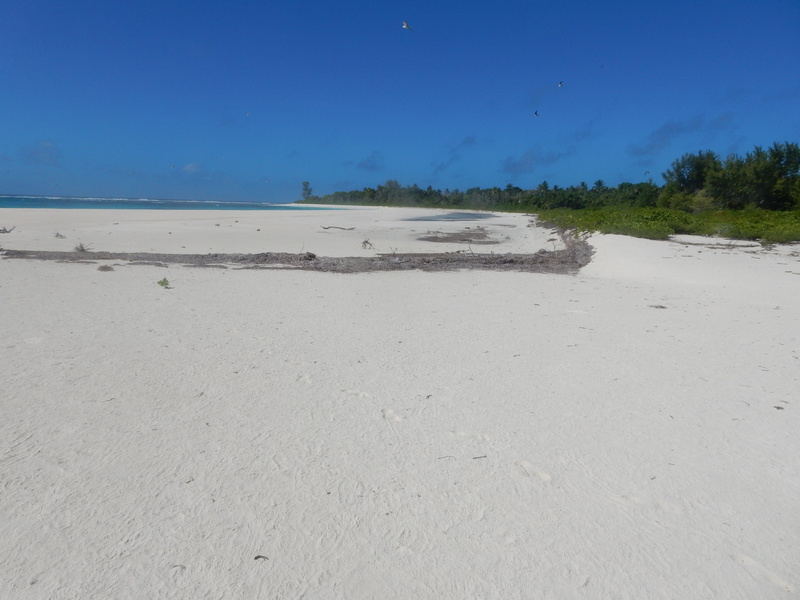 This beach has over recent years become very wide following the continued deposition of sand, leading to a series of ridges of sand with extensive hollows between them. Some of the ridges higher up the beach have become colonised by beach crest vegetation – plants that can tolerate sea spray and wind and confer some stability to the beach sand. The effect of the 13 July new moon high tide was dramatic by evening. 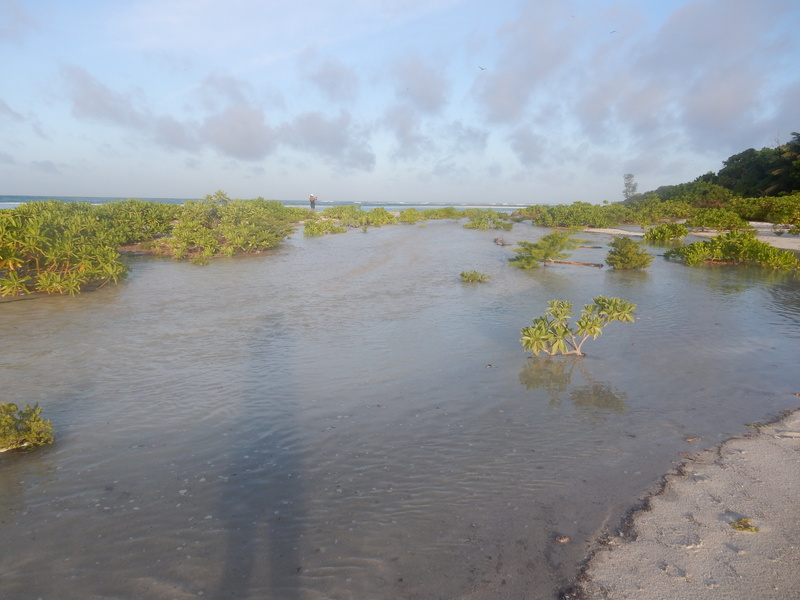 The sea broke over the seaward ridge and flooded the entire beach, creating a large lake. I had never seen anything like this before but Nic Savy, the General Manager, said that this had happened a few years previously. The following morning, we revisited this part of the beach at low tide. Most of the lake had drained away, leaving seaweed, pieces of driftwood and plastic waste along the tideline where the water had reached. 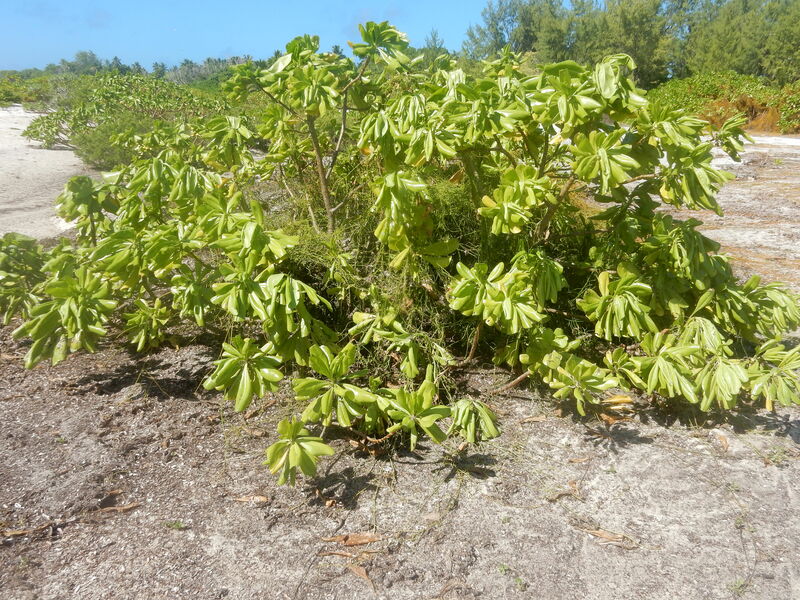 Already, the leaves of Veloutye (Scaevola taccada) bushes that had been submerged were beginning to wilt, suggesting that immersion the previous evening had been sufficient to kill much of the beach top vegetation. This will most likely revert the beach to an undulating sandy expanse, vulnerable to wind and sea erosion, before floating seeds of Veloutye and other littoral plants germinate and become established to provide another generation of stabilising plant life.